University expects jump in yield for class of 2018. The acceptance rate to the College has reached yet another record low at 8.38 percent for the Class of 2018. 2,304 students were admitted to the College this year out of a total of 27,503 applicants. 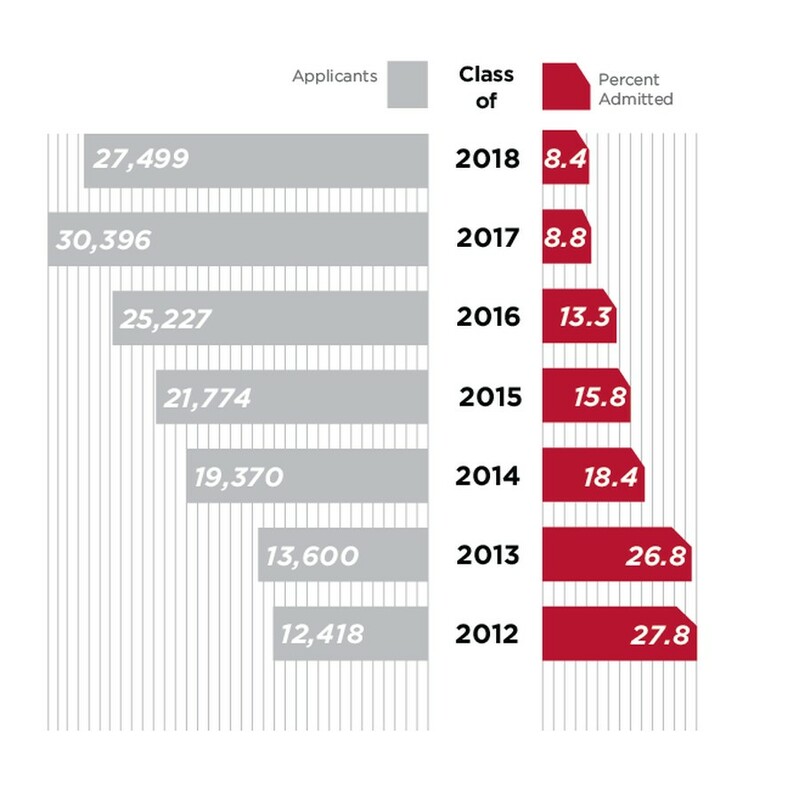 This decreased acceptance rate comes in spite of a 9.5 percent decrease in the total number of applicants as compared to last year’s application cycle. University spokesperson Jeremy Manier said that this discrepancy is due to the University’s prediction of a higher yield rate than that of previous years. The yield rate is the number of students who choose to attend the University out of those who were accepted. Manier said that the University predicts the class size to be around 1420, which would require around a 62 percent yield rate. The yield rate for the class of 2017 was 53 percent and the yield rate for the class of 2016 was 47 percent. The acceptance rates for peer institutions this year were similar to those of UChicago. Northwestern accepted 12.9 percent of applicants for the class of 2018, UPenn took in 9.9 percent, Columbia’s acceptance was 7 percent, Duke’s was 9 percent, and Brown accepted 8.6 percent of applicants. In recent years, the University has cited developments like the Institute for Molecular Engineering, the Logan Center for the Arts, and UChicago Promise scholarships—which allow recipients to graduate debt-free—as reasons for the increasing popularity of the College. Patrick Andrade, a senior from the north side of Chicago, applied regular decision to the College and was offered a full-tuition Chicago Police and Fire Department scholarship but has not committed to UChicago. Andrade said that he was not originally planning on applying but decided to apply when he found out about the Institute of Molecular Engineering’s new undergraduate major. Maura Joyce, a resident of the southwest side of Chicago who was accepted Early Action and has committed, said that she is also interested in the College’s Core curriculum and the possibility of taking classes at Booth.